The late Norman Fain, one of the principal owners of the Apex stores, would only occasionally visit his properties. Most times it would be at night about an hour or so before closing. Mr. Fain was a quiet, unassuming man and I think very few of his employees even knew who he was as he wandered the aisles dressed in a conservative, grey suit with a fedora perched on his head. “Good evening, Mr. Fain.” I said as he entered the major appliance department in his downtown Pawtucket store where I worked part time after my Army discharge in 1971 and my return to college. “Keep up the good work.” he intoned as he headed for the garden shop. These days I think of this, and many other memories, every time I drive past the rusting pyramid, the stain splotched facade and the unkempt grounds of the present, sad iteration of the once iconic Apex Pawtucket store. My family, and I suspect many other local families, had a long history tied in with the Apex store evolution. Both my parents worked at the original Central Avenue location. My Father in the appliance department (apple and tree analogy) and my Mother as an office assistant in the 1960’s. My first job when I became old enough to work was in the product pick up warehouse. One of our many duties was bicycle assembly. To break the monotony of this boring task we devised a “test track” to assure the quality of our work. We built multiple ramps by angling shipping pallets propped up on mattresses and we’d ride pell mell over this course with tires squealing on the concrete floor. One afternoon a much older supervisor, perhaps back from a liquid lunch, ramped things up by constructing a circle of fire for us to jump through! So, if you received a singed bike for Christmas from Apex in the 1960’s now you know why. Despite these shenanigans I was promoted and at 17 wound up as a salesman in the men’s clothing department. I was a very shy teenager and my first customer was a stunningly beautiful young woman who I guessed to be in her early twenties. I was so tongue tied I barely was able to answer her questions. She was buying an assortment of shirts and ties for her boyfriend. I was bedazzled! Who knew such angelic creatures existed? My nerves were so frayed during this, my first retail sales transaction, I could not even get her selection into the Apex shopping bag. With profound patience, and I believe a bit of humor, she helped me arrange the gifts to fit the bags. During the next few years the Apex empire expanded with new stores and I managed to gain some maturity and much needed confidence. College and Uncle Sam intervened and yet, as noted above, I once again turned to Apex after my Army stint for a perfect part time job while finishing college. In fact it was while working in the major appliance department of the Warwick location that I was recruited by a wholesale distribution company and a long, satisfying marketing and sales career was launched. in 2003, would not be pleased. Neither are the many former employees of this once cherished institution. The ballpark proposal failed. The city is talking about purchasing the Apex site for future development. Let’s hope the parcel becomes something to be proud of and the obstinance of one man does not prevail. Now, here’s the truth about the real friends of Mr. Fain. If a sales associate at an Apex store noticed the numeral “3” as the third digit of the Apex credit card that signified a true friend of Fain and no credit checks were needed! Jim Raftus, a retired marketing executive, lives in Cumberland. If you miss both the North Salem Street red lights in “downtown” Apex, North Carolina you will drive through the center in about one minute. Why then does such a small stretch of road, 750 miles from where I live, hold such a deep reservoir of fond memories? The short answer is checkers. My daughter, Katy, and my grandchildren, Molly and Jack, moved to the Apex/Cary area five years ago. My wife and I make certain to visit from our Rhode Island home a few times a year. Our times there are always a whirlwind of activities; Durham Bull baseball games, events in Raleigh and making the drive to swim in the ocean at Wrightsville Beach. Yet, what thrills me most, and stays in mind longest, takes place on the circular top of an upturned whiskey barrel in front of The Rusty Bucket store on North Salem Street in Apex. Painted on the rough surface of this barrel top is a checkerboard. 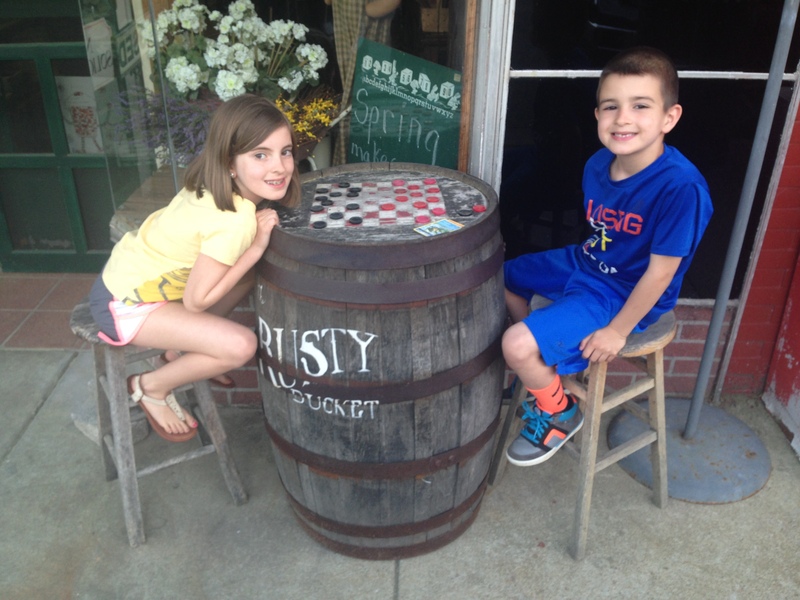 Young Jack, now six years old, loves to play checkers with Gramps at this spot. I think he and I start anticipating our matches weeks before Grammy and Gramps’ arrival. We started playing about three years ago. That first year I had to teach the then three year old grandson how the pieces could move, what “king me” meant and to not let go of a piece until you were sure of your move. His Mom, Grammy and Sister were happily occupied spending time, and a little vacation money, at the All Booked Up and Gone Stitching stores which also grace North Salem Street. This affords Jack and me enough time for a few games which have become increasingly competitive as the years roll by. No longer do I have to teach. Now I have to be wary for Jack has learned how to trap me in a corner, he now spots every multiple jump and knows how to defend his back row. Next year I’ll give him my final piece of checkers advice. I’ll let him know he has a “tell”. When he has made a move that puts him at an advantage he raises his eyebrows above those beautiful dark brown eyes, which will one day drive the girls crazy, and Gramps knows to check the board for impending danger. Last year Jack told me he was learning chess. He’ll have to tell me how those pieces move! At a certain point the females of our family, done shopping, will join us and we will head off for some delicious pizza next door at Anna’s a place that destroys my Northerners’ assumption that you can’t get good pizza in the South. Or, maybe we will cross the street to enjoy some wonderful comfort food at the Salem Street Pub. No matter which place we choose we will likely top off our meals with some ice cream at the simply named, The Ice Cream Store. Flavors like Birthday Cake and Superman for the kids and Vanilla Fudge for the adults. Sometimes, after the food carnage, Jack and I will be informed that the ladies want to check out the goods in The Rusty Bucket. He and I will exchange quick glances and smiles while heading back to our checkers match. Somewhere, way back in my family lineage, there was, supposedly, an ancestor who worked for a cooper. The story has it that he made, and installed, the round metal straps which secured the barrel’s wooden slats in place. I think of that long lost, perhaps even fictitious, relative as I sit on a wobbly stool in front of an old barrel playing checkers with my grandson Jack on a tiny stretch of North Salem Street in Apex, North Carolina which has become my favorite spot in the world.